I opted to learn how to use the mail merge features of MS Word linked to Excel, as each year my wife goes on about the hassles that she gets whilst trying to mail 4000 people & how difficult it is to get it right. So this is what I learnt as I cracked the issues that she couldn’t, so this time next year her job will be that much easier. I thought I’d add it as a blog post for two reasons, first to help you and second to remind me how to do it. Next launch Word and write a letter. Now for the fun bit, work your way through the wizard, select an your Excel file to use & add to the existing letter an Address Block from the left menu, this will add in the address for each person, then choose a Greeting Line both of these two options reduces the amount of work that you have to put into your letter and personalises it to the max. Now to cover one of problems my wife was having, she wanted to being able to have 3 letters printed to 1 page, thus saving on paper. if you just copy and paste the text 3 times on the one Word document then this doesn’t work, it’ll just repeat the same persons name and address 3 times. Time format, by default you’ll get all sorts of weird time formats. To change what time format gets displayed you need to editing the field code with Edit Field… this is available by selecting it on a right click on the current field, in this case on the merge field marked «Time» Then Field Codes button and add the following to get just the hours without any seconds. The above information mixed with a little bit of trial and error with make you a master at the Mail Merge functionality of MS Office. Top Tip: If at any point you feel that the Mail Merge Wizard is not doing what you ask it to do, then it most probably isn’t. Its a complete wind up and learning how to do a mail merge by using the menu bar tools is the best advice I can give. Second Top Tip: If at any point you want to remove the mail merge information from the word document, do so by opening the document, click on the Mailings tab, click the down arrow under the Start Mail Merge button, click on Normal Word Document. This will disconnect the Word document from the source document. Click image to enlarge, it’ll show that I have «AddressBlock» , «GreetingLine» , «Date» , «Time» inserted into the merge, each postcard is in a Text box, with smaller text boxes inside. This then keeps each merge record together, so when a «NextRecord» is called it knows where to put the details without missing any information. Like the issue that Karen is having below, if you read the comments. The page that I will end up I want to quarter so I have 4 post cards per page. On each post card I want different student’s information (student’s last name, student’s first name, student’s middle name, teacher’s name, grade). On my template I put on 3 of the post cards before each last name. When I merge, it is skipping student’s names. Can you help. Thanks. Correction – On my template I put on 3 of the post cards before each last name. Yes! My was doing similar, don’t use the Word mail merge wizard, add the merge tags to the document then run the merge, it might be the wizard which is causing your issues. Stick with it, it’ll click! Still working with it. It is merging the correct first, middle, last names, teacher name, but it is not picking up the correct test score. I am using the next record although it is nowhere on the 1st record. Next record is inserted on the 2nd, 3rd & 4th records only. Only use Next Record once at the start of each postcard and not on the first postcard. Try that, see if it helps. Thank you. That is what I have, and for some reason the student’s score is not correct. In my Excel spreadsheet, each row has the name, teacher’s name, score. On the Word document the names are printing correct but the 1st score being pulled is from Row #3 and it is duplicated on the second record. The 3rd record has the score from Row #5 and it is duplicated on the 4th record. I have a setup a bit like what you are after, I will add it as an image, to see if it helps. I’ll take a couple of hours. Hi Karen, I’m just about to add an image to the above post, hopefully it will give you a hand on what I did in order to get multiply postcards on one page. I believe that the info I need on the mail merge is right at my fingertips and unfortunately I am not able to click on your image to expand it. Hello Raymond. Thank you for the work you have put into answering my question on mail merge. Unfortunately I am not able to click on your image and I believe that would answer my problem if I could see your image. I too cannot click on the image. Take a look now, refresh the blog page with Ctrl F5. Thanks so much for this tutorial. This is exactly the information that I was looking for, I shall try it out now and get my mail campaign together. Many thanks again! This is great – I have one other query though. I am making raffle tickets and have to a page, but on subsequent pages it goes back to the second value. For example: I have ticket number 101, 102, 103 on page one and then page two goes 102, 103, 104… how can I keep it going consecutively? I’m having the same problem. I’m merging two records on each page. The last value on each page is repeated as the first value on the following page even through I have put the “Next Record” command in front of each field code. I thought I had this problem, but when you actually print, it goes away. I had the same problem with student cards. I designed a full page student card and merged it to my students list. I finished the merge and clicked edit individual document and selected all. When this is complete I clicked file then print and chosen 8 pages per sheet. Try it. 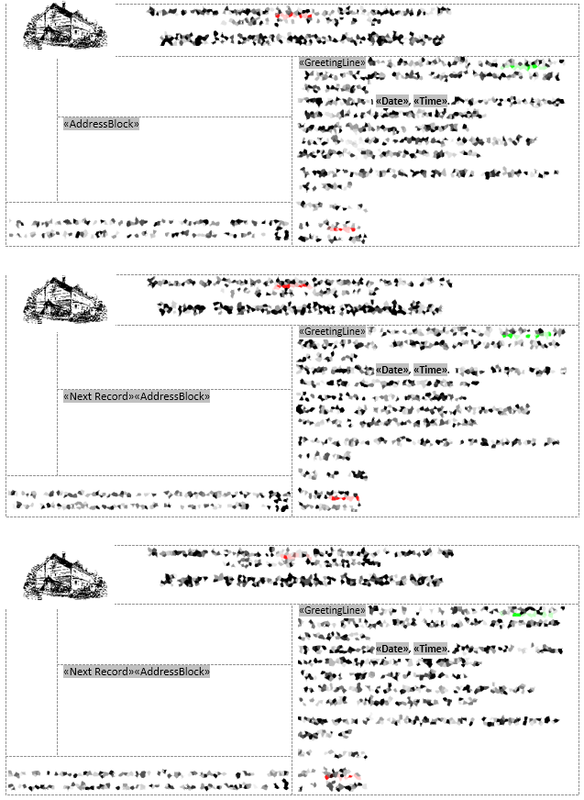 If word gives you a problem save as pdf and select many pages on one sheet. Thakgudi – You’re a frickin genius. That worked perfectly. I think this will help me solve a problem. I have a document that works well for printing three per page in Publisher, but have just tried adding mail merge fields to personalize it. Silly Question: Could you detail how to to add the <> merge field? Do I just add it as a column header in my excel spreadsheet? THANK YOU! The merge field is added in the letter template, it is just displayed as Open arrow ExcelSpreadsheetColumnName Close arrow. Hello. I am trying to merge more than one record into a text box (so I can merge more than one record side by side). I have read through the info above but keep getting an error stating “You cannot include DATA, NEXT, NEXTIF, or SKIPIF fields in comments, headers, footers, footnotes, or end notes.” Please Help??? OMG having the same issue…trying to print 4 “labels” per sheet, but getting 4 duplicates of label on each sheet (sheet 1 has four of label 1, sheet 2 has 4 of label 2, and so on). I have done the “Update Label” step and see <> three times, but still no luck…I have tried printing (in case the preview was inaccurate), but it does the same thing. Unable to Merge to PDF, gives me an error of “Unsupported Word Field” (that being Next Record). Help, please! Should it be <> or or something else? Upon further Googling, I’ve discovered that the issue is using Mail Merge fields inside a text box, which is exactly what I’ve done. I’ll rethink my strategy, sounds like using tables is the way to go. requires a little bit of tweaking but the end result was as required. This worked just as I wanted to do – and had about given up on how to do it. I am creating 4″x6″ horizontal layout post cards with return address and recipient address. The Avery forms I’m using have two postcards per page so I set up my mail-merge “letter” by making two copies – top and bottom. Since I want address #1 to print at the top and address #2 to print at the bottom – I inserted the Next Record” field at the first line in the bottom post card. I found it uner the Rules item on the Mailings Menu. Worked just like I wanted. Thanks. Thank you so much! This is what I have needed to complete a task for my boss. I appreciate the fact I didn’t have to tear my hair out to get this done! I am having the same issue, but putting <> isn’t working. It just repeats the same information with <> in front of the name for the second and third letters on the page. Any suggestions? Great tip for more than one record on a page. Thanks. However my data contains hyperlinks and dates both of which lose format, the link appears as text with the display content but url is lost, and date becomes usa format. so can you print 4 per page postcards using mail merge? I’ve been searching hi and lo to no avail. Hi, I’m trying this to print story cards for my agile project, two to a page. I have a table on the mail merge page with two rows, one for each card. Each card has several fields in it, the first one being “Summary”. What I have done is put in front of “Summary” only. I thought this was merging correctly, but it turns out that it is missing every third record. You can’t see this on the print preview, which seems to say it is repeating every second record, but that is the result in actual printing. I sure wish I could view your samples, showing all commands. All I see is gibberish. Cannot read anything. As others, I want to merge 4 postcards per page. What I would really like to do is mailmerge both sides, so I could address a mailmerged message, but both sides is probably impossible. So, I will settle for addresses only. If I could only read your samples. Hello, Thanks for everyone’s suggestions. I wanted to make individual cards for primary students with all their personal logins and user names in one spot. I ended up making the original merg doc in publisher as a custom size (about a business card, 8 to an A4 page size). Then did the merg and ended up with 24 separate pages. When printing I selected “Multiple PAGES to a sheet” it is will print 8 different records on each page. I’m not sure it’s the most effective work around but it’s working. Inserting next record didn’t help.